StarCraft came out 20 years ago and became one of the most popular and prominent esports ever made. Maddy Myers and Eric Van Allen of Compete were children when the game came out, but they grew up surrounded by StarCraft’s legacy. Now that Blizzard has released a remastered version of this classic game as well as StarCraft: Brood War, we’re taking a moment to revisit what made it great and why it’s still relevant today. Eric: Hey Maddy! I don’t know about you, but I’ve been in a euphoric haze of custom games and Battle.net nostalgia for the last few days. StarCraft: Remastered is out, and oh my, missile turrets have never looked better. What’s your time with Remastered these last few days been like? Maddy: I feel like this game looks the way you would remember the original StarCraft looking, but then if you actually boot up the original StarCraft (or Brood War), you’re like, “Wow. This looks like crap.” It’s as though Remastered has managed to capitalize on my own memory of “how StarCraft looked” with rose-colored glasses. It’s weird, though, because when I first started playing it, I almost couldn’t notice what was different. But not in a bad way. I guess we should mention it’s in 4K. So many pixels! WAY more pixels. Eric: Soooooo many more pixels. The zoom in and out can get pretty crazy. But yes, the original menu pops up and it’s both a welcome return and a little hit of realization. Everything is a little crisper, a little more defined, but nothing really stands out. I do appreciate the new portrait animations, which are subtly the biggest update here. Kerrigan’s hair looks a little more normal, and good ol’ Jimmy looks young and full of hope. Oh, Jimmy. So much I wish I could tell you. I haven’t yet delved into the Protoss campaign, but what I’ve played of the Terran campaign gives a good impression, if not a very similar one. Maddy: Yeah, I’ve just been playing the campaigns. If you’ve been brave enough to venture into multiplayer, I’d love to hear about it! I started with the Brood War one, which kicks off with Protoss (my main, and yours). Midway through that I realized I wanted to go back to the beginning of StarCraft’s Terran campaign and replay everything. The other part that I thought was my imagination, but it turns out actually has been updated, is the game audio. I felt like all the Protoss barks sounded crisper and those corny synths felt all the more energizing, butI wrote it off as nostalgia at first. Turns out the game audio has also been remastered as well. So that’s another little touch that makes a huge difference, at least for me, a person who has been obsessed with the StarCraft music for years. E: Oh boy, multiplayer. The bravest I’ve been is to play some Big Game Hunter. Just getting my hands back in the right movements, finding my StarCraft cadence again, has been a little crazy. The music has helped though, and I’m with you on team Music Makes Me Play Better. I think the biggest realization for me has been that, for everything that’s been updated, there are a few glaring omissions. I know there are a lot of Brood War purists out there, but there are a few quality-of-life changes that happened from StarCraft to II that I wish had been implemented. Control groups still being limited to 12 is an obvious one, but not being able to control-group multiple buildings and having to manually assign workers rather than rally-point them to minerals feels clunky after getting so used to StarCraft II’s controls. I know some folks want Brood War to play exactly as it did years ago, but even having an option to toggle “legacy controls” on or off to allow for some of those features would have been really nice. There’s an effort here to keep the core gameplay as intact as possible, an effort I respect, but also one that’s maybe dulled my interests in reigniting my competitive flame. This is the dual upside and downside of StarCraft: Remastered, though. The game has to accommodate people who are still playing the original StarCraft, so it’s a fancy re-skin with no changes under the hood. There are two decades of strategy that no one would want to mess up, and if you change even the tiniest thing, it’ll upset long-belabored build orders. But, as you say, that’s exactly why I’m not that excited about hopping back into multiplayer, where I’d be facing off against people who’ve been playing this version of the game for 20 years straight. So is the game actually welcoming to newcomers? I mean, we all know multiplayer isn’t. But does the campaign hold up, or at least inspire people to learn more and/or start watching StarCraft tournaments? I’ll be pretty curious to see what happens there. But the big question is, what does this mean for StarCraft as a whole? There was the showmatch in Korea where the old pros were trotted out for a few quick games, but will the new generation latch onto this? I’m unsure. For all its faults, StarCraft II had young blood in it, working to move the game forward. I don’t know if Brood War Fever can be reignited overnight, or where a strategy game fits in an age where games like League of Legends and Overwatch seem to have taken its spot in PC bangs. I still get excited watching a good game of StarCraft play out in front of me, and the new tools help a lot. The zoom function in particular gave me a much greater appreciation for the scale these players work on. I’m just hesitant to say this is the thing that will reignite a fan base. If anything, it feels like more of a love letter, a reminder of a singular point in time, and a good excuse to go back and replay some of those great campaign missions and ridiculous custom games. M: I think it would be amazing if Remastered somehow reignited interest in StarCraft as a spectator game again, since it’s definitely not topping any ‘most-watched esports’ lists these days. But I’m not sure if that’s because team shooters or MOBAs are inherently more interesting to watch. We talked about this on Kotaku Splitscreen very briefly this week, too, how StarCraft is actually pretty easy to watch and understand even if you don’t know a lot about the game. In my lifetime, I’ve heard many stories from non-gamers telling me that they went to a StarCraft event and got way more on board than they expected. There is something there — some reason why this game worked so well and paved the way for so many other esports. This seems like a really kind 20th anniversary present from Blizzard to us. I guess if I go deep on that “anniversary” metaphor, then it’s like Blizzard trying to reignite the passion in a 20-year-old successful marriage. But even if that “passion” doesn’t come back, the relationship is still steady. Any closing thoughts? Do we want to talk about some mods real quick? You have a lot that you like. E: I mean, you can’t go wrong with the classic customs. Tarpit Defense, Heaven’s Last Stand, Lurker Defense, Bunker Defense. 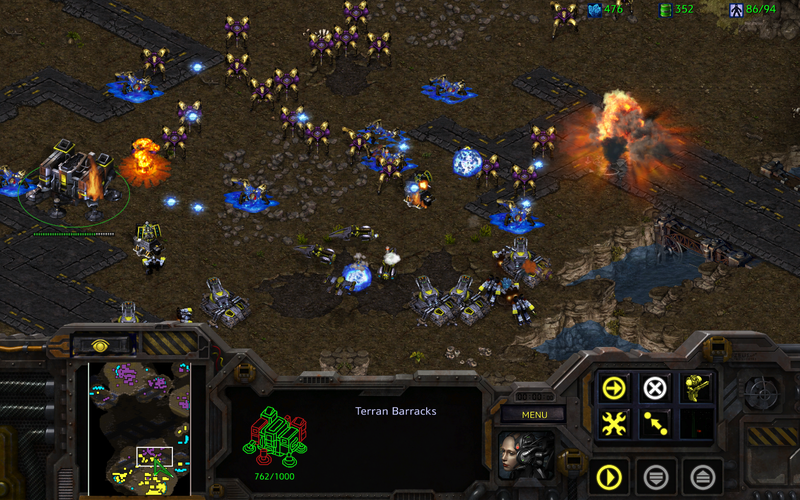 StarCraft was at the forefront of defense game innovation. Aeon of Strife is neat if you want to see the game that inspired DotA, and I played a pretty cool Robert’s Rebellion map last night that simulated Game of Thrones’ warfare in StarCraft. It’s not quite WarCraft III when it comes to customs, but there’s still plenty of gold out there. At the end of the day, Remastered does feel like more of a sentimental present. I like the marriage metaphor, because this is also definitely Blizzard taking a hold of wherever StarCraft might go next. But there were hold-outs who stuck to Brood War long after Wings Of Liberty launched, and no doubt they’re happy to just have a few more pixels to work with. For me, I may not waste away my weeknights on Battle.net customs anymore, but I got nostalgic enough to go digging for my old Brood War guide book and relive some old memories. If nothing else, we’ll always have Mar Sara.